Eating – what’s his appetite like, what does he eat, does he feed himself… S generally loves food and loves feeding himself trying to use a fork and spoon! Sleeping – he goes to bed lovely about 6.30-7pm but usually wakes once a night – 10/11 or 2/3. Sometimes we give him a dream feed, sometimes he still wakes later on. We give him milk to go back to sleep, you gotta do what you gotta do! She thought he might be hungry but I think he eats as much as he can in the day… I think it’s just a bad habit now! Walking – he’s taken a few steps but he much prefers bum-shuffling. She saw him walking while holding on to the sofa so she was happy with that. She told me that bum-shufflers end up having more supple limbs which I never knew! Climbing stairs – yes he can! And a few points he’s gone to climb the stairs when he’s ready for bed, clever boy! Words – by this age they want them to be saying 2-6 words and S says mamma, Dadda, nanna and his brother’s name. She heard him babbling lots and she said babbling is good as it means they’re trying to talk! Pointing – can he point at things he wants? Yes! Usually the things he’s not allowed! Hidden things – if you hide something, does he realise it’s hidden? Yes – remote controls!! And he’s great at hiding things himself… last week I lost my car keys… they were in the mop bucket! Pincer grip – can they pick up little things? Yes – raisins is a good example! Scribbling -can he hold a pen and scribble, yes and my work notepad is testament to that! Potty training – he’s showing no signs of being ready for this, but most don’t until they’re about 2 so I’m not even sure why they ask this?! Vitamins – the only thing she didn’t mention is vitamins, some other mums have mentioned that we should be giving them vitamin supplements? Weight and height – so the thing I was most nervous about didn’t even happen! As S was getting grisly for his nap, she told me to put him down for his nap if I wanted to… and said not to worry about his measurements. She could see that he was happy, lively and alert so I guess she was happy! So all in all a good visit. He’s had a tough few weeks of teething but seems ok again at the moment. Still loves music and his big brother! 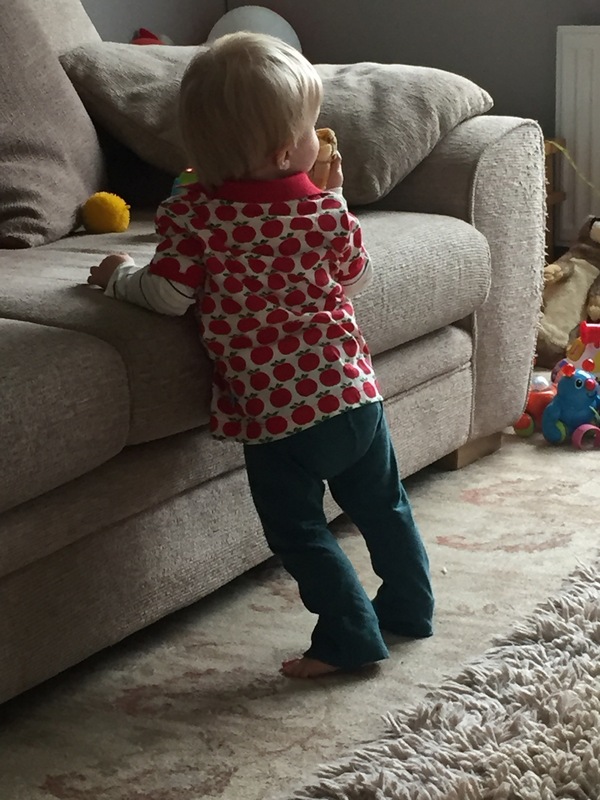 Talking of his brother it’s always nice to compare their updates – funny they both had 12 teeth by 15 months, funny I was calling W a toddler but S isn’t quite toddling yet so still our l’il baby! Previous Previous post: REVIEW: Cocobubble – dinosaur bath-time fun for kids!